This is a “bi-authored” post if there is such a thing. What i mean by that is I began posting something of what I was seeing, some of my current experience in the Winnipeg airport, and try to relate it in a “colorful” fashion. I soon realized it have little to do with my Journalling” or didn’t think it did. Hence I began again with a new post here with the idea of clarifying my thoughts. The problem now is that neither is getting completed, boarding has been announced, and I feel no closer to accomplishing my original goal. I’m leaving too many posts incomplete, it’s something I need to work on, an improvement in my learning I can seek. Writing, Does it run in the family? Well the weekend flew by and although I did get some things done I neither blogged nor wrote in my journal. It’s interesting that when listening to the radio yesterday they were interviewing a female singer who commented about writing and journalling. She was speaking mostly in regards to writing music or poetry but she did say any type of writing was important to keep the mental juices flowing. I do enjoy the writing and blogging but would like to know that I’m doing something other than just putting words on paper (or blog), that I or someone else is benefitting from it. I do know that the act of journalling is helpful, and other things I’m doing like reading or even playing Spider Solitaire are keeping my mental acuity sharp as a knife. Ya right. They do actually help keep my mind stimulated and I do believe I am seeing improvement in memory and motivation, something that was/is sadly lacking. Improvement can always be made though, and procrastinating less is also showing promise. Mom has finished her 2nd book and is waiting for the illustrations to be completed. I don’t recall if I’ve commented much on them but she’s told her publisher she will do 5 books in total. Her first, on poetry, the second a childrens book, the third an autobiography, four and five I’m not sure. Writing must run in the family. I’m off to see Gloria tonight, my visits are now about a month apart. I do miss the chats and where I often have to remind her about things that are happening in my life, and my family and people in it, she is very helpful and most often I come away with AHA moments. I will likely talk to her about Mo and Ay again in hopes she has another nugget on ways I can handle any “miscommunications” they have. It’s been a while since I last posted, almost a week. Mostly we’ve just been on the road but there have been periods with no cell service as well. Poor excuses all really. G says I shouldn’t worry about not journalling every day but if this blog does become read it’s important to be consistent, or followers may drop it. I suppose that’s a minor concern and really the issue is my being consistent. 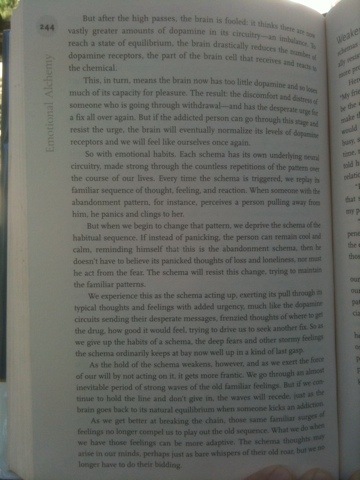 Aside – I’ve begun rereading the book “Emotional Alchemy” and it has refocussed my attention. I have slipped in a number of my interactions and some of my responses to others are becoming inappropriate in that I’m snapping and being short. I do this in reaction to comments being made by them, to or around me. I can do better. Typically my shortness is with my wife Mo, and where I find her comments lead me to react in a certain fashion she is not deserving of my shortness with her, nor any rudeness I may feel to obliged to treat her with. The current chapter in the book is comparing the progress and setbacks one encounters as being analogous to one’s journey through drug or other chemical addictions, often making significant progress and then suffering setbacks. It states, as far as brain function goes, there is a parallel between emotional habits and addictions. It has to do with the dopamine balance in parts of the brain, and the quantity of receptors that are in use. Update on Dad, he’s been taken back to emergency complaining of hallucinations. I feel very torn, on the one hand feeling very concerned for him and what to become of him, on the other tired of the frequent hospital visits. And that makes me feel bad, rather I feel badly of myself thinking that way. I don’t feel like the shining example of a son that I’m seen to be by some others. But hey this shouldn’t be about me, he is the one that is potentially on his last legs . But hey again this is my blog and IS supposed to be about me and my feelings of the things that are happening to and around me. Well wouldn’t you know it, trying to login on my laptop but it doesn’t like my multiple attempts to login, it appears I can’t remember the basic things such as my password. Duh. My visit with G went well, she thinks a blog is a good idea and feels it may help someone. She had suggested I write, fiction was where she was headed I think but this venue fits well with my journaling. I suppose some history would be helpful here, without some background this won’t mean much to anyone. I’ll work on a way to integrate it. It’s also possible that I’ll import the existing blog from Blogger, although at this stage of the game I don’t know how much value it will hold. Depression is the subject, and my journey through it. It’s my hope this will help someone else on their journey. I was outed, as far as the diagnosis went, back in April I think. I didn’t feel “right” and it was nothing I could put my finger on. I’d made a road trip last year and I felt very low during portions of my alone time. I was thinking the D word, not death, but divorce. It was certainly nothing my wife or family would have seen coming but it was weighing heavily on my mind. I can’t even really remember the why of it, only that it seemed like a solution at the time. I was sad…..